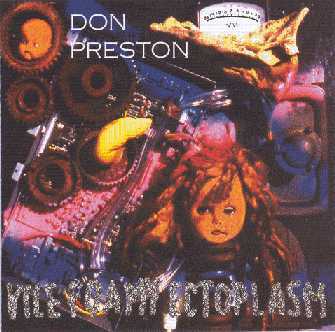 in 1993, don preson released an album called "vile foamy ectoplasm" on muffin records. the 2007 release on crossfire has 10 tracks in common with the 1993 release. don preston: modular moog, mini moog, moog theremin, steiner e.v.i. recorded 1994 at don preston's studio in l.a.
 miss lucy: "i like it" * jimmy carl black: "donnie,", "gettin' hot?" * jim 'motorhead' sherwood: 'how 'bout double load?" * howard kaylan: "ooh man!" from 1967-1968. don preston recorded and edited this piece. later, in 1993, he used the new digital technology and de-noised and eq'd each edit, of which there were hundreds.